Rugby is a market town in England. Here the Rugby School, a "public school", was founded in the 16th century (in Romania, we call it a private school). The school has earned a great fame into the 19th century. The legend tells us that during a football match between students (match that took place in 1823) one of them, namely William Webb Ellis, took the ball in his hand and took it to the field of the opponent team, thus inventing a new kind of football (football meaning any team sport involving kicking a ball with the foot). The cup given to the team that wins the rugby union World Championship bears the name of this alleged inventor of the game. 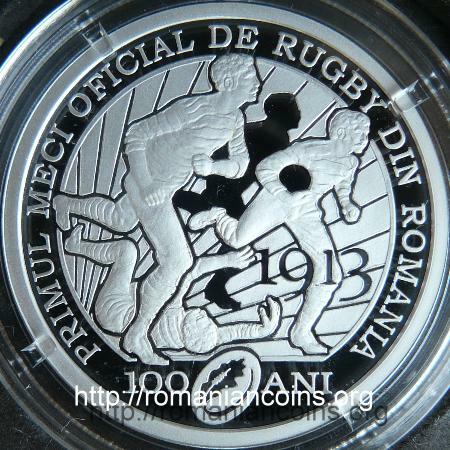 The first rugby match held in Romania took place in 1909. The players were former students returned from France, who had discovered and practiced rugby during their studies. The new sport began to organize itself, and in 1913 there were already two clubs, which played the first official match - the one honoured through this coin. 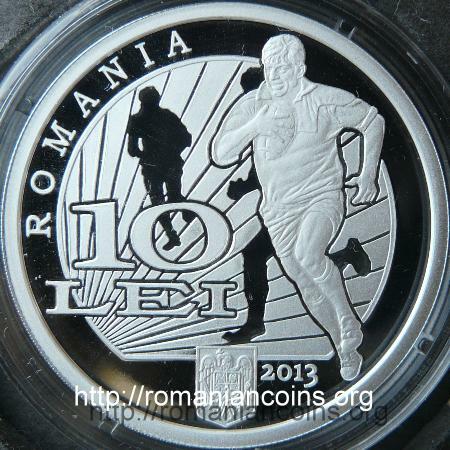 In Romania at least the rugby union was and still is a sport practiced mainly by people of good social conditions.